Trauma comes in many forms. So does the way we process this trauma, and the way we express it. For me, as an oral historian, this translates to how I conduct interviews and how I prepare for them. For the next couple of months, I’ll be reflecting on this for the OHC’s Field Notes section of our blog. I began this discussion in September, talking about a project that I’m working on with the Presidio Trust, a former U.S. Army base-turned National Park on the northern edge of San Francisco near the Golden Gate Bridge. 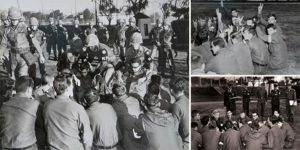 We’re interviewing people who were involved in, or related to, the Presidio 27 mutiny that occured on October 14, 1968. Events in honor of the 50th anniversary will take place the weekend of October 13th and 14th at the Presidio. Special care needs to be given to interviews that focus on trauma, as do the pre-interviews. The same rules do not apply for trauma-centric pre-interviews and the process must be flexible. Even just the idea of sitting down for an interview to recount these memories can be anxiety producing. It’s important for the interviewer to keep this in mind and be willing to adapt, or even abandon, their normal practices. I was confronted with this recently for an upcoming interview. The narrator, who has been interviewed before for a book, agreed to participate in our project. During our first pre-interview, which I conducted with Presidio Historian, Barbara Berglund Sokolov, he expressed uncertainty about his memory and his ability to recall certain events. He was upfront about an illness that he lives with and the impact it has had on his life. He was specific about areas that he did not want discuss, which we noted and will respect. He viewed this pre-interview, which lasted for about two hours, as the first of several. He requested that we put the interview outline together and mail it to him. Once he reviewed it, we would meet again to talk about the content. This is not normally how I operate. I usually have one meeting with a narrator wherein I schedule the interview. But, I needed to be flexible here, especially if I wanted to build rapport, create trust, and help cultivate a setting where he feels comfortable sharing his story. So we agreed to his request for multiple meetings before the actual interview. Barbara and I put together interview outlines shortly after the first pre-interview meeting and mailed it off to the narrator. A couple of months passed until we met again. This time around, he seemed much more relaxed and comfortable. Though it was clear he hadn’t read the outline, we took no offense. We understood that he needed to read it in the company of others to discuss these memories and become more comfortable with doing the interview. This meeting lasted for another couple of hours, at the end of which he expressed his desire for more time. We agreed, because we wanted to ensure that he felt agency in the process. Before the oral history interview, the three of us will have met at least three times. There will be more time spent doing pre-interviews than the actual interview. And this is okay. It may not be what I’m used to, but it feels right to allow the narrator his space to share his story on his terms. This is another form of shared authority, one of the many reasons that I feel so compelled by oral history. Our flexibility in the process will not only strengthen the interview, but hopefully it will allow the narrator the most support.